One of the most common words in the Welsh language is “bach”. It means “small” and it’s sometimes used as a term of endearment. The German Bach family of musicians was anything but small. In fact, it was enormous. Many of them were involved in music and the family – with over fifty known musicians and several notable composers – played a significant role in musical history for nearly two hundred years. Of course the best-known of the whole bunch was Johann Sebastian Bach (1685–1750) and when anyone speaks of Bach, they’re referring to him. Popular books on musical history usually refer to Bach’s twenty children, but actually his family life was plagued by death. Only ten of his children lived until adulthood. Poor little Johann August Abraham Bach, despite his grandiose name, lived for only one day after his birth, such was the staggering incidence of infant mortality during the early eighteenth century. Wilhelm Friedemann Bach circa 1760. History has conveniently filtered out the lesser Bachs and today we need concern ourselves with only three of them apart from the old man himself. The most influential sons were unquestionably (1) Wilhelm Friedemann (2) Carl Philipp Emanuel and (3) Johann Christian, who became known as the “London Bach” because he lived there for twenty years, quaintly known to the locals as John Bach. He was the most forward-looking of them all and his music was greatly admired by Haydn, Mozart and Beethoven. Wilhelm was the eldest son of J.S. Bach and was born in Weimar on St Cecilia’s Day. She is the patron saint of musicians so it must have seemed an auspicious day to come into the world. Johann Sebastian took particular pains over Wilhelm’s education and in later life helped him find employment. But despite the initial promise, Wilhelm’s career never really came anywhere near his aspirations, let alone his father’s high hopes. He had problems with employment, possibly due to his difficult temperament, and his lack of income eventually led him to pass off many of his father’s compositions as his own. Things must have been desperate indeed and he finally died in poverty. 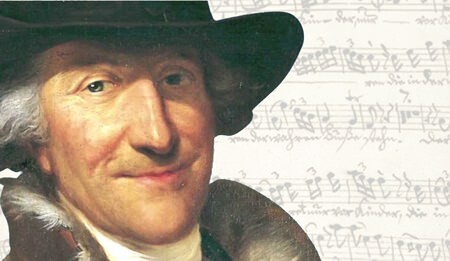 Even so, Wilhelm was a talented composer and had a reputation as the most accomplished improviser-organist of his time. This cantata was written when Wilhelm was Director of Music in Halle between 1746 and 1764 where he was required to perform a cantata every third week and on all other religious days. Although the work kicks off in a lively style, some of the music must have sounded distinctly old-fashioned at the time and not that much different to that which Wilhelm’s illustrious father was writing thirty years earlier. His reluctance to totally embrace newer musical styles may even have led to his luckless financial situation. Even so, this is fine music and makes for fascinating listening. The soloists are superb and the German chamber orchestra uses period instruments to get as close as possible to the original sound. Carl Philipp was Bach’s second son and just four years younger than Wilhelm. He became one of the foremost harpsichord players in Europe and is today considered the most influential among Bach’s children. This was the age of royal patronage, and musicians were aware that a university education was essential for those who could afford it. For one thing, a degree opened doors to other jobs if times got tough and a distinguished university background discouraged royal employers from treating their musicians like servants. So like his brothers, Carl Philipp went to University and studied law. At the age of twenty-four he acquired his degree, and was finally able to turn his full attention to music. Carl Philipp became known as the “Hamburg Bach” (for reasons which must be obvious) and drew musical ideas not only from his godfather Georg Philipp Telemann but also from Handel. While his early works are rooted in the Baroque, his style gradually moved towards the new classical principles, especially in his ground-breaking symphonies and keyboard sonatas. This seven-movement Magnificat was written in Berlin in 1749, and was the composer’s first major choral work. The sparkling first movement reveals that Carl Philipp is moving away from the Baroque yet the work clearly shows his father’s influence. It contains some gorgeous music and the performance is given in the splendidly neoclassical Konzerthaus Berlin, acoustically one of the best concert venues in the world. And it’s a fine performance too, with excellent soloists, brilliant instrumental playing on period instruments and splendid choral singing.